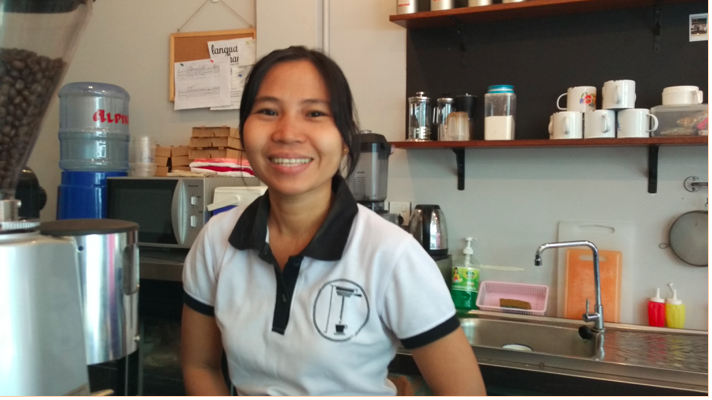 Thanks to a ten-month work training programme at Yangon Bakehouse, Thin Thin Aye has gone from being a school dropout who tried to make some money from sewing, to being the family’s main breadwinner. Yangon Bakehouse (YBH) is run by a group of social entrepreneurs based in the capital of Myanmar, Yangon. The founders of YBH saw Yangon’s growing expat milieu as a potential market and wanted to start a bakery of the type seen in Europe and the USA that serves baked goods, light meals and coffee. The founders combined this idea with social entrepreneurship by setting up a training programme and turning YBH into a training arena for women who fall outside the labour market. One of these women is Thin Thin Aye. After she dropped out of school, she tried to make a living from small sewing jobs. This proved difficult, and she was recommended to try YBH’s ten-month programme. Training with YBH has taught her new skills and – not least – given her self-confidence and faith in her own abilities. Having completed the YBH programme she passed her exam, and won an employment contract with another coffee bar in Yangon, Press Office Coffee. Thin Thin Aye has become her family’s main breadwinner. PfC’s cooperation with YBH includes providing English training to those in the YBH programme. PfC also provided YBH with a loan which enabled them to set up a branch in the reception area of Telenor’s headquarters in Yangon, and we have put YBH in contact with the Norwegian restaurant group Drueklasen AS which has contributed to YBH’s professional development through its CSR programme. Our contribution to YBH was made possible through a financial contribution from the Løge Foundation. Read more about the cooperation between Yangon Bakehouse, Drueklasen and PfC.